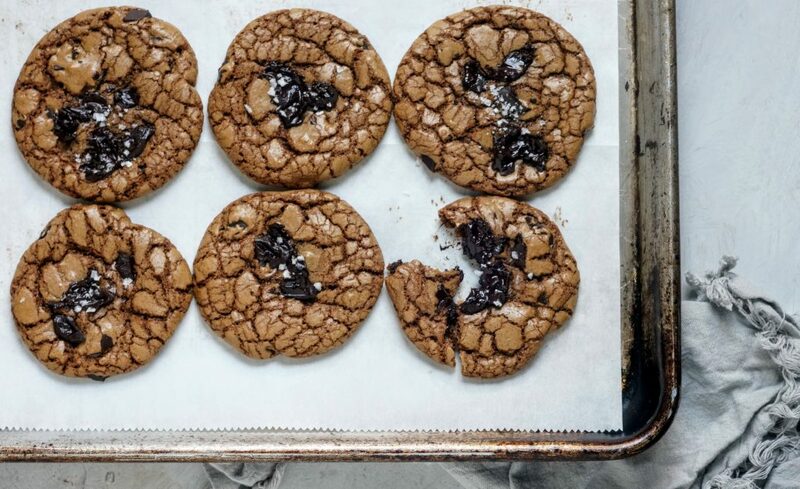 Carapelli Olive Oil elevates these cookies from simple to divine. There are some things that you just fall in love with. Cute babies, fresh flowers, the smell of a fresh rain, new shoes and these cookies! Seriously, you will fall in love with these cookies because they are soft, chewy and have such a depth of flavor. Since fall is on the horizon, a few extra cookies is just what the doctor ordered. Add some molasses and brown butter and we’re really talking fall! 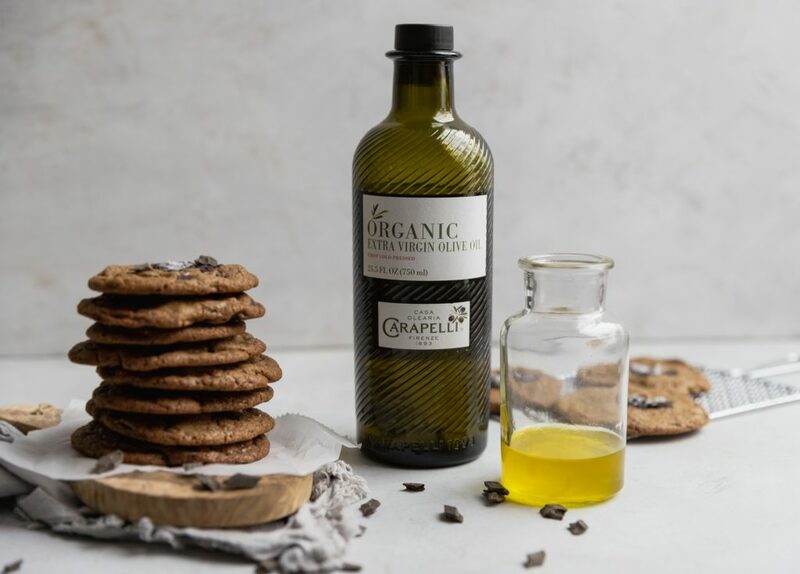 A touch of Carapelli Unfiltered Organic Extra Virgin Olive Oil makes these cookies really special, that nutty flavor plays so well with the brown butter and molasses to create a perfect treat. Scoops of this perfect dough get ready for the oven. Then you have to decide do you want them: CHEWY or CAKEY? So many choices and so many variations. I’m a big fan of a chewy cookie with a crispy edge, the ultimate balance. If I want a cakey cookie, I’d rather just eat cake! 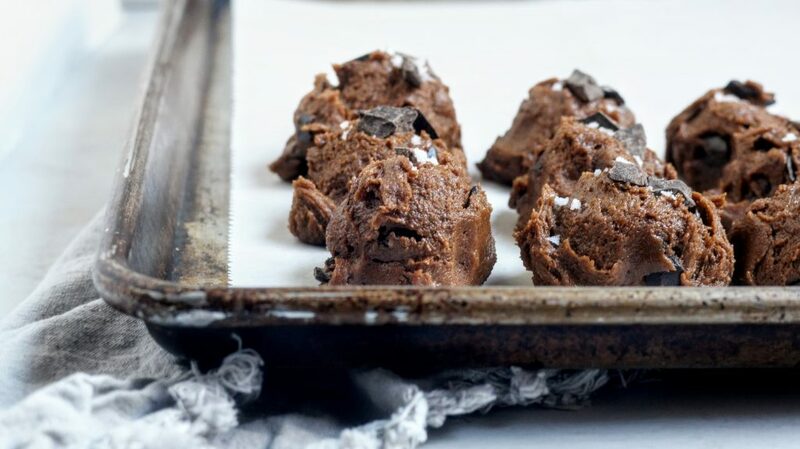 These cookies go one step beyond your average chocolate chip cookie with the addition of cocoa powder. 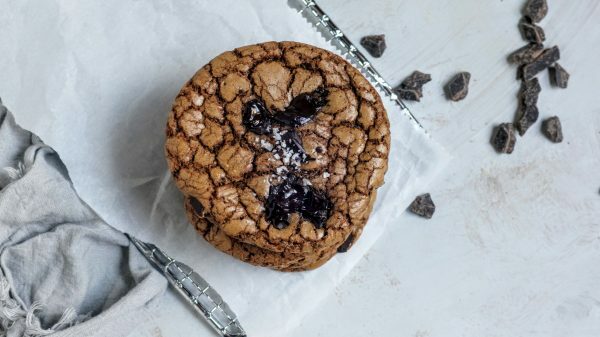 The cocoa powder gives the cookies that signature crinkle and really make it decadent. I’m not saying these are the BEST cookies you’ll ever have, but I do think if you don’t try them you may regret it. Don’t you want to sample a bite of heaven? A cookie that has deep flavors of olive oil, molasses and brown butter, giving them an almost caramel note? So, grab your mixer and make a batch today! Those puddles of chocolate and salt are rich and gooey! As always, I would love to see your creations! Tag me on Instagram @CosettesKitchen or post on my Facebook Page. Preheat oven to 325 degrees F. Makes approximately 24 cookies. Line 2 cookie sheets with parchment paper or silicone mats. In a small saucepan, melt your stick of unsalted butter. Allow to melt and slowly begin to brown. You'll start to see brown bits forming, stir and swirl the pan making sure the butter doesn't burn. You'll start to smell some caramel notes, remove from heat when browned. In your mixing bowl, cream together the melted (but cooled) browned butter, olive oil, sugars and molasses. Beat in the vanilla and eggs until creamy, about 5 minutes. Slowly mix in the dry ingredients (sift the baking soda and cocoa powder), mix until just combined. Add in the chocolate chunks. Drop cookies (about 2 tablespoons per cookie) onto cookie sheets 2 inches apart. Bake for 15 minutes then top with additional chocolate chunks and flake salt. Bake for another 3-5 minutes until edges are crisp and centers are soft. Allow to cool in the pan for 5 minutes then transfer to wire rack. **You can freeze cookie balls (omit salt) on a sheet pan then transfer to a ziploc bag. Pop out a few cookies whenever you want and bake them off. **Best to bake 1 cookie sheet at a time, if you bake 2 at once, swap trays halfway to ensure even baking.